The discussion centres on Complicité’s The Encounter and Riotous Company’s Out of Blixen. Rather than linear, it considers devising as a process ‘unfolding’ from key ideas and central personnel, often deemed ‘catalytic’ in creative process models. 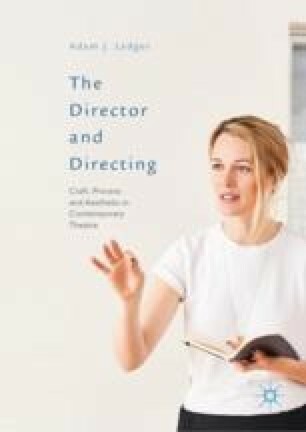 Through a discussion of key writings and examples of contemporary devising, the position of the director is variously assessed. Prevalent concerns with hierarchies are instead recast in terms of authorship and traditions of training, and that devising often overtly embraces extant text. The aurality of The Encounter extends neuroaesthetic consideration into the sound experience. Out of Blixen is seen as a troubled process, at odds with the company’s previous actor-centric stress on improvisation, and physical and musical composition in bespoke scenographies. Both pieces are further complicated since the directors perform in each, raising questions of decision-making. Form and space are considered materially performative (Erika Fischer-Lichte). Ultimately, devising is seen as inherently circular in process. Mia Theil Have, conversation with author, London, 7 February 2017.